Philip Morgan first started freelancing when he was laid off from his job as a technical writer at an agency in 2008 during the US recession. In the beginning, he had one big client, but when he lost them overnight Philip was without work for weeks and vowed never to make the same mistake again. Since then he took responsibility for his own sales and marketing and was able to break free of the feast or famine grind to create a reliable stream of clients for his business. Today, Philip hosts The Consulting Pipeline Podcast, has written two books on brand positioning, and helps development shops use positioning, content marketing, and marketing automation to get higher rates, better clients, and a build better pipeline. This isn’t a new strategy, but it is still one that most agency owners (especially the ones that need it most) resist. 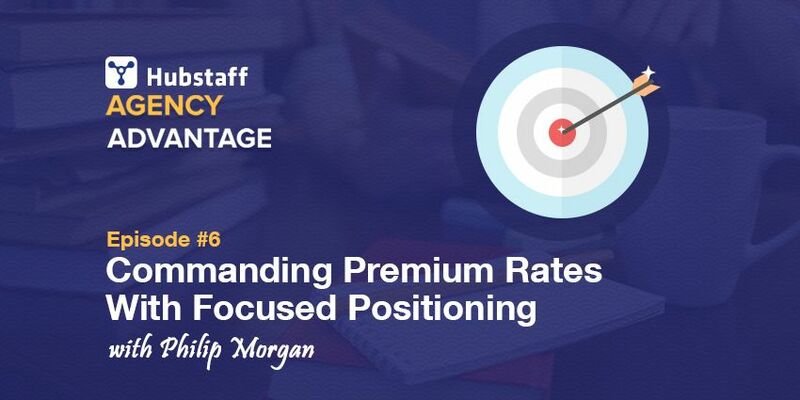 To help overcome that, I broke down my chat with Philip into an FAQ covering the most common concerns people have with narrowing their focus with strong positioning. To get the full story, be sure to listen to this episode. There is a ton I wasn’t able to include in these notes. If you ever feel like you are treading water, or have trouble charging premium rates, then this is an interview you won’t want to miss. To get it out of the way, this isn’t something that everybody needs to do. There are plenty of agencies that thrive as generalists, but doing so often requires a strong network. If you can have a full pipeline and are charging rates you’re content with, then that’s fine. But, if your clients are constantly price shopping you and it’s difficult to sustainably gain new business, then improving your positioning is something you should strongly consider. By focusing on a specific problem for a specific type of client and solving it in a specific way, you are going to gain experience much faster than if you do everything for everybody. There are limits to what a generalist can claim. If a professional soccer player breaks their foot, they aren’t going to go to a general surgeon to get it fixed, and they definitely aren’t going to a physician who “does a bit over everything.” They are going to go to the surgeon that only works on feet, and ideally one who only works on feet for athletes. For somebody running a business, the mindset is not that different; they are putting their business in your hands and want to know that you are able to take care of it. Being an expert at solving their specific problem is an easy way to do that. By specializing, you are able to minimize the risk your clients take on when working with you because they know that you have solved the same problem for other businesses like theirs. While you are excluding a large portion of the general market, the market that you are now serving will want to work with you instead of any of the generalists. Also, you’ll be able to charge premium rates since there is lower risk involved with working with you. Solving a specific problem in a specific way doesn’t need to be boring. The methods you use to solve the problem will always be evolving as you gain experience, so you won’t be mindlessly repeating the same exact tasks in the same exact way every single day. Beyond that, you will be surprised at just how much there is to learn, even within a narrowly defined focus. If you do get bored, there isn’t anything stopping you from taking on projects outside of your narrowly defined scope. Your marketing should be focused on your positioning, but you will have people who come to you with projects outside of that focus. It is up to you whether or not you want to take them. And if you find there is another segment you could better serve and enjoy more, then there is nothing stopping you from switching. Word of mouth is a powerful tool in small markets because everybody talks to each other, so if you start delivering great work to a few clients, other people who could benefit are going to hear about you. To grow more reliably than by referrals, you need to work on promoting yourself. Luckily, it is much easier to build an audience when your focus is narrow versus general because you know exactly who you are writing to and it is easier to find where those people are. If you have proven your expertise at solving an expensive problem for businesses and have shown you are willing to teach other people, there are countless opportunities for you to take a shortcut to building your own audience by borrowing somebody else’s. Practically every niche worth pursuing will have its own ecosystem of blogs, conferences, podcasts, etc. The people who have cultivated those audiences now have the new problem of coming up with more content to make sure their audiences continue to pay attention to them. This is where you come in. Reach out to these influencers and offer to speak, guest post, or come on their podcast to talk about your expertise in a way that will be valuable to their audience. With whatever medium you choose, make sure there is a way to send that audience back to a content resource you created and get them on your list so you can build a relationship with them on your own terms. This subject can, and has, filled a book on its own. If you want to learn more about promoting yourself and building an audience, I recommend Kai Davis’s website, Double Your Audience. Yes, because your agency doesn’t actually need a huge audience to thrive. How many clients does your agency need to succeed at the levels you want to reach? Do the math using conservative closing rates and average project sizes to see how many clients you actually need to get where you want to be. You’ll be surprised how attainable that number seems. To get that many clients, you probably don’t need a huge list. Instead, what you need is a list of people that trust you and see you as a true authority in your field. It doesn’t take much trust to hand over your credit card to a SaaS company for $19/month, but if you are selling $50,000 consulting services then it is an entirely different story. With audience building, always go for quality over quantity and relentlessly work to get that audience to trust you by providing them with value time and time again. There are over 100,000,000 websites out there built on WordPress. There is no way that your agency is so large that you need to target each and every one of them. Small niches can be very profitable, but if you are scared about going too narrow, at least take a step back and realize that you are likely far too wide for your goals. The best way to get started is to head over to Philip’s website, positioningcrashcourse.com and sign up for his free email crash course. If you have any questions throughout the course, you can reply to the emails and he will personally respond to help get you on the right track. What makes you stand out from other agencies offering similar services? Share your own unique positioning in the comments below.